A - Director Gus Van Sant, now in his mid-fifties, is enraptured with the psychology of young people. There are few living American filmmakers as unflinching and unabashed in their artistic curiosity towards the teenaged or young adult mind. Van Sant's new film, Paranoid Park, is more than a reaffirmation of this impulse: it may be his most gently ambitious and conscientious work to date. The film hums with a jumbled, embryonic sensibility that is strangely effective, and often outright devastating. 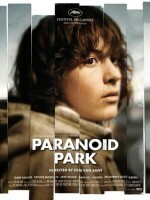 Van Sant's tangled approach inherently precludes the dramatic ferocity that might have made Paranoid Park a legacy knockout. That said, what the film offers is a valuable, pained glimpse into the adolescent heart of darkness, realized with visual and aural audacity. Alex (Gabe Nevins) is a doe-eyed Portland, Oregon high school kid who drifts through the fringes of that city's skateboarding culture. His separated parents are nearing an inevitable divorce. His possessive girlfriend is pressuring him to take her virginity (and soon). School is a bore, and skating is the only thing that holds any interest for him. Something has happened to Alex, Something Bad. This event compels him to scratch out his memories and reflections in a notebook, and it is these writings that he narrates in a halting voice-over. Paranoid Park is a snarled and meandering film, and by necessity. Alex is telling his own story, and as the kid freely admits, he didn't do so well in his creative writing class. We sense that he has difficulty organizing and articulating his thoughts even under normal circumstances. In relating the Bad Thing that happened one Saturday night near an illegal skate park, he can barely find his footing. He glosses over significant events, skips around in the chronology, backs up and begins again. His disjointed story is part confession, part therapy, part act of creative defiance. If Paranoid Park were a straightforward mystery, this stuttering structure might feel cheaply affected and exasperating. Fortunately, Van Sant has created something far more penetrating and determined. This is pensive psychological drama in the fullest sense of the term. Crucially, the nature of the traumatic event in Alex's tale is revealed at the film's halfway point, and yet it is not a deflating moment. Van Sant crisply conveys that Paranoid Park is not about the event, but about Alex's understanding of and responses to it. The film establishes its interest in the inner world quite literally. Van Sant maintains the focus on Alex in shot after shot. Few directors are confident enough to linger on their protagonist in silent close-up for sixty seconds or more, permitting the camera to search and wonder at what lies behind their eyes. Van Sant often deliberately underlights Alex, capturing him as he ambles or sulks within gray-yellow shadow, evoking a twilight melancholy and menace. The director also splices in skateboarding footage, much of it shot in raw 8mm, to suggest Alex's state of mind, whether wistful, sullen, or obsessive. Characters wander into Alex's field of vision and ours. The adults in his world are frequently off camera, off-center, or out of focus, only snapping into clarity when he shifts his attention to them. Characters speak but he does not hear. One exception is a police detective (Daniel Liu), whose penetrating eyes and cunning questioning unnerve Alex. What does he know, and what does he suspect? Nothing, Alex's skater friends reassure him. Yet they know even less. Most of the young actors in Paranoid are unpolished and naturalistic. Nevins' performance is slightly more studied, but it feels remarkably real in its awkwardness. When he intones, "There's different levels of stuff" in all seriousness, we're seduced by the convincing, twisted-up apprehension in such an adolescent faux-insight. There are acting misfires, however. Taylor Momsen as Alex's girlfriend Jennifer, and Lauren McKinney as his sort-of friend Macy don't find the same tone as the other performers. Momsen is far too calculated, as though she stepped out of a mainstream teen comedy. McKinney, meanwhile, taints her lines with a self-conscious quality that is distracting. Paranoid Park lacks a climax or even a clear resolution. The film offers a cathartic release that is more whimper than bang. There's something a bit soggy and forced about the enterprise that prevents the film from congealing into a true landmark for youth film. I can only describe this problem as a half-hearted striving for accessibility. (The over-the-top intolerability of Jennifer comes to mind as an example of this disappointing tendency.) This inclination contrasts with Paranoid Park's otherwise stunning insistence on a daring, credible vision. These are minor quibbles in tone, however. I left the theater musing that Paranoid was a lesser cousin compared to the searing, unblinking glare of Van Sant's Elephant. Now that I've had a day to ruminate on it, I believe this latest film is not only more obviously compassionate, but also a richer and more maturely motivated work. It's rare for a tale of teen angst to achieve the haunting qualities of Paranoid Park without a parting sucker punch. Here Van Sant wallops us in the middle and then lets Alex and us spend the next hour—indeed, the rest of our lives—getting our breath back.